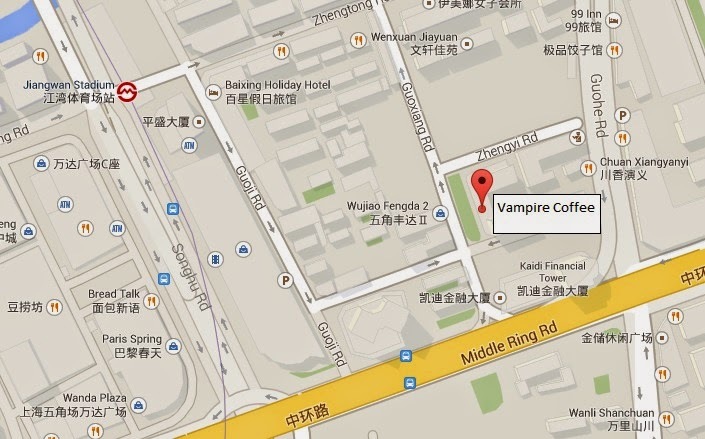 Located in the Yangpu District, near Fudan University lays a not so hidden cafe where young people seeking the thrill and mystery of what lurks in the dark go to grab an ominous treat. Actually, Vampire Coffee is not as gothic as you might think. On my last visit, it was filled with teens dressed in bright pop colors and featured bossa nova mixes playing out of the speakers hidden behind fake cobwebs. Although true goths may cringe and turn away from this cafe, I found it perfectly kitschy and wonderful. The cozy cafe can hold about ten guests and is decorated in a suitable red and back pallet with vampire and bat memorabilia lining the walls. A tiger pattern mosaic lines the back walls. I fell in love with that tiny Dracula action figure! These velvet chair are super comfortable! This cafe was a welcome relief from the hot and humid weather. I really did feel like a vampire retreating into a cool dark sanctuary! As soon as I entered, I was greeted by a staff member dressed, similar to the decor, in red and black. He kindly gestured I pick any available seat and handed me a menu. *This is a take away menu. Vampire Coffee offers your usual cup of coffee and cake, but with a twist. Cookies and cakes are shaped like coffins, bats, brains, fingers and other ghoulish treats. The coffee and other drinks are fun colors and some are even served in skull shaped glasses! I ordered a basic black Americano (my favorite! ), bat cookies and a blood supply bag. Don't get grossed out. The bat cookies are simple sugar cookies and the so called "blood" is a delicious mix of strawberry and grape juice. A fridge full of 'blood'. The bat cookies were nothing to write home about. They were simple in flavor and all together not amazing, but the cute little bat shape brought a smile to my face and almost made me forget the lack luster flavor. On the other hand, the coffee was surprisingly nice. It had a smooth flavor without the bitterness associated with this sharp beverage. Bats fly over a full moon at Vampire Coffee. The menu is only available in Chinese, but the waiters/baristas know a bit of English and were very kind and helpful when I was obviously looking at the menu with a confused expression. The fake brick walls give the cafe a nice dungeon like touch. You can now easily follow my blog with Bloglovin! Liz Lisa Shanghai has closed! National Day Sale at Jiu Guang!